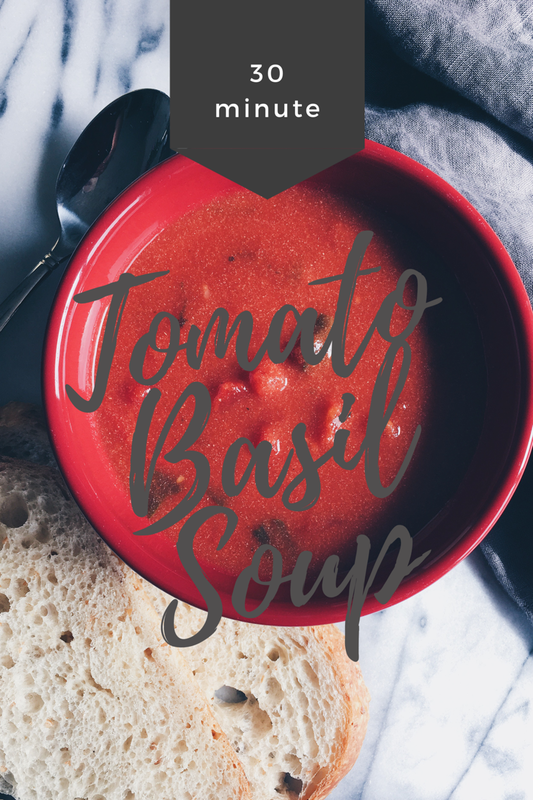 Today I’m sharing my go-to recipe for an easy 30 Minute Tomato Basil Soup recipe that you can whip up on any busy night to enjoy a comforting meal in no time. If there’s one meal I could eat literally everyday for the rest of forever it would be a bowl of tomato basil soup with some triscuits and cheddar cheese dunking action if I’m having lunch, or an open face grilled cheese for a more substantial dinner option. 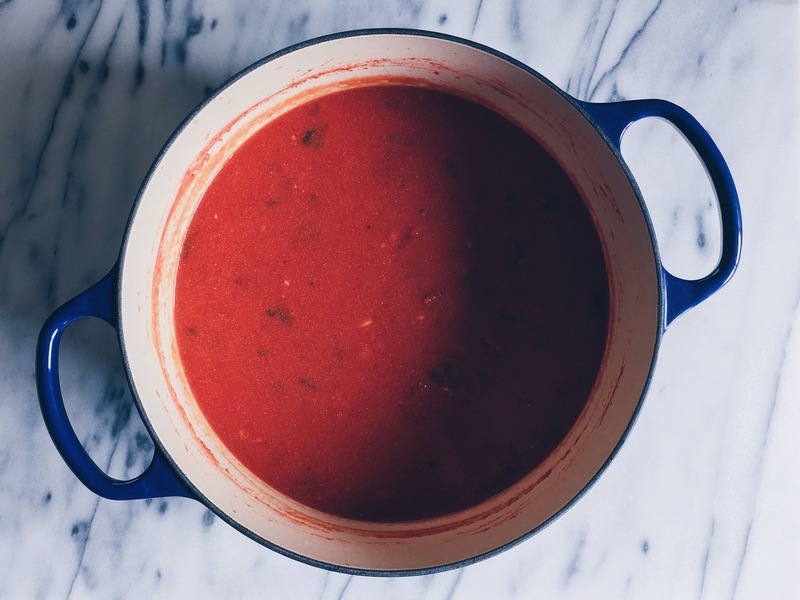 This soup comes together quickly, is hearty from the chunks of tomato and rich tomato flavors, topped off with basil for the classic combination everyone loves. I love warming up with a big bowl of soup and cozying up on the couch when it’s cold outside, and I’ve been doing this a ton lately. 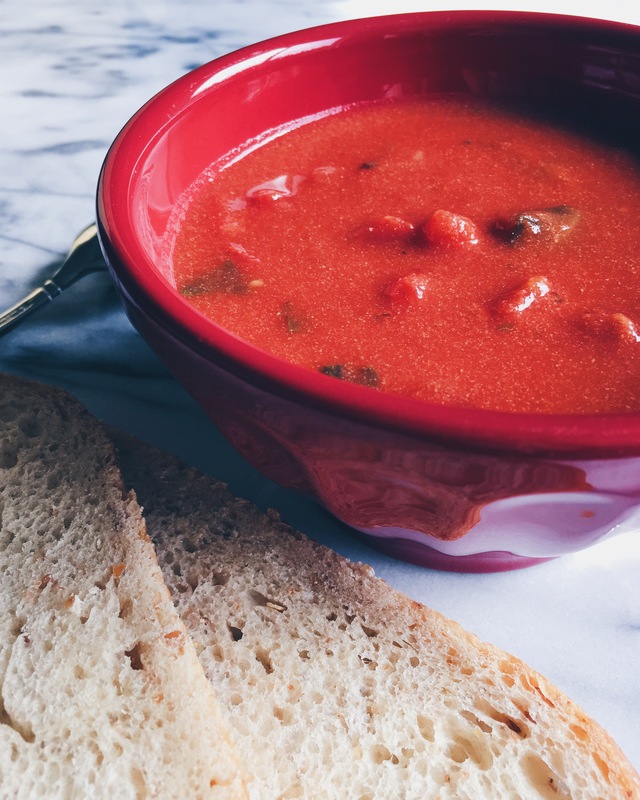 Back to this tomato basil goodness… soup + something to dunk…not many things are more comforting than that. Everyone should have a recipe for a bowl of comfort they can whip up in a jiffy and this recipe will be your new go-to. Hope you enjoy this Tomato Basil Soup as much as I do! In a large heavy bottom pot combine the crushed and diced tomatoes, chicken broth, garlic and tomato paste. Give it a good stir making sure everything is combined and the tomato paste is dissolved. Let the soup come to a boil, leaving it uncovered for 10-12 minutes, stirring often. Reduce the heat to simmer and add in the sugar, milk and salt, stir until combined. Cover and let cook an additional 10-15 minutes. When the time is up stir in the basil. Add additional salt or sugar to taste. *Depending on the brand of tomato products you purchase you may need to add more or less sugar depending on the tartness, I suggest adding the sugar a tablespoon at a time and tasting until it is to your liking. For the salt, suggest gradually adding initial amount listed to taste, and after the basil is added add additional salt to taste. Thanks for stopping by CB EATS, hope you have a fun Halloween weekend! 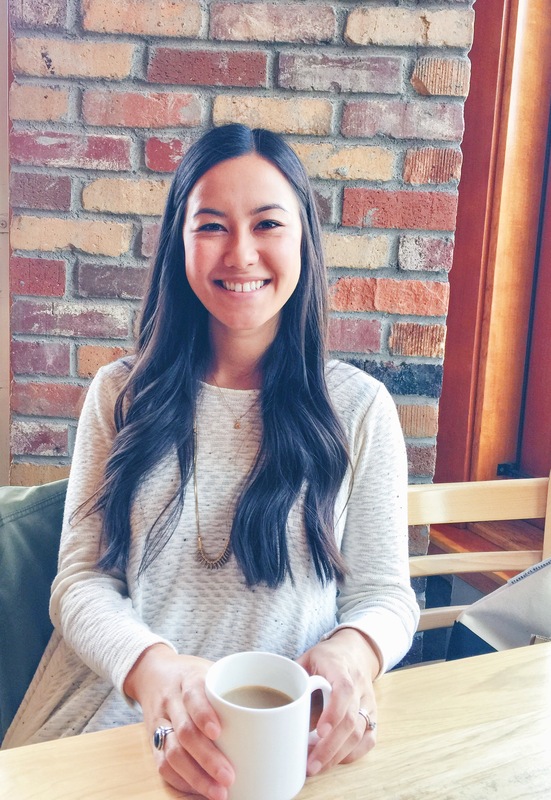 Follow CB EATS by subscribing to email updates or follow along on Instagram or Pinterest.